A huge week lies ahead for AFC Rushden & Diamonds. The race for the play-off places in the Evo-Stik League South Premier Division Central took a new twist in midweek as fifth-placed Alvechurch suffered a shock 5-1 home defeat to Barwell. With Coalville Town winning 4-1 at St Neots Town, it means just one point separates the teams between fifth and eighth with Diamonds being one of those clubs. Andy Peaks’ team have six league games left, the first of which sees them take on in-form Royston Town at Hayden Road tomorrow (Saturday). And while both Alvechurch and Coalville still have a game in hand on his team, the Diamonds boss insists there is still plenty of belief within his squad that they can secure a top-five finish. “It’s a big week for us and it’s a situation I am sure we would have taken if someone had given it to us at the start of the season,” Peaks said. “As far as the league is concerned, if we are being realistic and honest then we know things are in the hands of other clubs. “But it’s a good situation for us to be in and we certainly won’t give it up until it is mathematically impossible. “We need to go on a good winning run and that’s not something we have really done yet this season. The big games keep coming for Diamonds with this weekend’s clash being followed by the NFA Hillier Senior Cup final on Tuesday night when they will take on Vanarama National League North high-flyers Brackley Town at Northampton Town’s PTS Academy Stadium. And Peaks knows his team will have to turn in a big performance if they are to see off Kevin Wilkin’s side, who have enjoyed another outstanding campaign and look well set to clinch a play-off spot at the higher level for a second successive season. “The league is the priority but I think the cup final is something everyone is looking forward to,” the Diamonds manager added. “It’s an honour for us to be playing at Sixfields and against a very good team from the league above us. 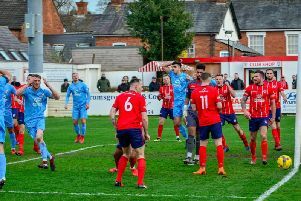 “We will try to enjoy the occasion but the only way that happens is by putting a shift in and making sure we are competitive because we are up against a very good side who won the FA Trophy last season, were in the play-offs and are set to be in them again.